One of my favorite word nerd activities is making up new words. Where would we all be without frexcitement, fouscous, opkeptical, and now: jicamadas. What the devil is an jicamada? A tostada made of jicama, of course. However, if I want new readers to find my recipes, I need to give the recipes titles that regular people can understand. Amongst us friends, this recipe will forever be known as Vietnamese Jicamadas. But for the sake of the rest of the world, it’s Vietnamese Chicken Salad. Credit where it’s due: this idea was inspired by two recipes I read last week: the Food Lovers’ Tacos with Jicama Shells and this recipe on TheKitchn. I brined the chicken first, and I recommend you do the same. However, if you’re in a hurry, you can skip the brining step, and you will be OK. The chicken might not be quite as tender and flavorful, but it will still be very tasty when nestled under the Vietnamese relish. A. I’m not sure that this recipe technically qualifies as fusion cuisine — a.k.a., a mashup of Asian and Mexican cuisine because “tostada” literally means “toasted” and my jicamada is not toasted, nor could it really be toasted, so it’s not really Mexican and, therefore, not really fusion (words matter, people!) — but I like to pretend, so… I just declared myself a fusion chef. B. This is clearly not authentic Vietnamese food… it’s “inspired by.” I replaced the traditional peanuts with cashews, used basil instead of cilantro, and just tossed together things that I thought would taste delicious, based on my memory of a bahn mi sandwich I ate on a sunny sidewalk in New York in 2006 (while wearing a white shirt, army green pants, a red plaid tie, and black Converse. I remember every detail of that day because it was so awesomely fun). This is not first date food because you have to eat with your hands and sometimes, just like when you eat tacos (Do you remember what it’s like to eat tacos?! ), the toppings fall off onto your plate. But that means when have hoovered in your last bite of jicamadas, you can scoop up the remnants from the plate for one last, perfect bite. These guys are awesome summer food: cool, crisp, flavorful, light, and easy to make. You could make them half the size and serve them at a party, even! The jicamada bed is a sweet, crunchy balance to the peppery bite of the relish, and the little bit of mayo adds a creamy kiss that gets close to recreating the magic of a bahn mi sandwich. You can play around with the ingredients: cucumbers would be a good addition or substitution in the relish, and you can swap in cilantro for the basil. Brine the chicken. Place a 1-gallon zipper storage bag inside a large bowl so the bag is standing up. Pour 4 cups of water into the bag, then add 3 cloves garlic, salt, and peppercorns. Stir with your hand to dissolve the salt, then add the chicken to the bag. This will look a bit unappetizing; avert your eyes. Seal the bag and place the bowl in the refrigerator for 2 hours, then rinse the chicken well and set aside until poaching time. Prep the relish: In a large bowl, mix the carrots, radishes, jalapeo, garlic, cashews, basil, and mint until combined. Add the lime juice, rice vinegar, oil, and fish sauce. Toss with a rubber spatula to combine. Add salt and pepper to taste, then let the relish sit at room temperature so the flavors can meld. Assemble the jicamadas: Spread an jicama slice with a little bit of mayo, then sprinkle lightly with salt and black pepper. 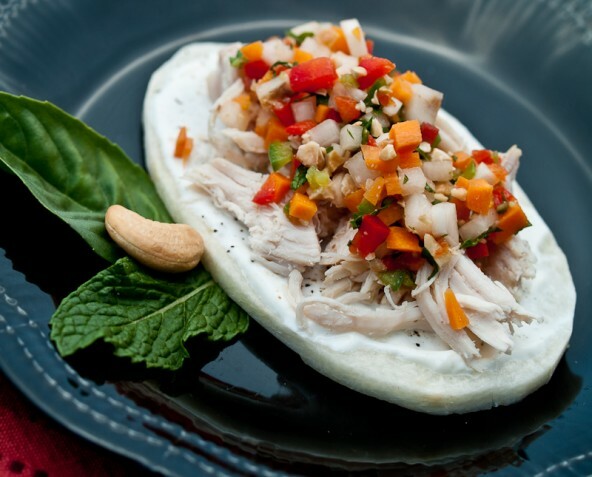 Pile shredded chicken on the jicama, then top with a few spoonfuls of the relish. Repeat, repeat, repeat. Eat with your hands, licking your fingers often. Hello author of my favorite cookbook ever! Why do I keep hearing that cashews aren’t paleo but you keep teasing me by throwing them into awesome looking food!? You’ve got an awesome attitude and I wish the best to you. Much love! Cashews used to be verboten, but most of the paleo/primal experts I follow have given them the greenlight. Peanuts are OUT, but cashews are in. “The cashew is, however, one of the richest sources of phytic acid in the nut and seed world, containing more phytate than almonds, hazelnuts, walnuts, and chestnuts. For that reason, I consider it helpful (and perhaps paramount) to soak your raw cashews before consuming them – especially if you’re trying to get over tooth decay or combat osteoporosis. It’s the little things! I was super excited when Melissa and Dallas gave rice vinegar a thumbs-up — Asian food is saved! This sounds fantastic! I don’t have a clue where to get jicama in Australia though. I’m not even entirely sure what it is. It looks kind of like a potato, though I know you can’t eat them raw. I wonder what would be a substitute? Zucchini? Japanese radishes? Help! @Sarah: I was AMAZED to find Jicama at South Melbourne market today- only helpful if you live down here… It was an Asian vegetable specialist so perhaps try a local asian grocer? Apparently I am not just a fountain of useless information but also a conglomeration of bizarre associations. This looks like a fun recipe. Can’t wait until my Thai Basil grows up, I think it would be great in this recipe. Love that you’re dropping a Dominican Friar reference on us. YAY! That is brilliant. I’m pretty much drooling over here. Jicama is such an underused ingredient – I’m so excited to see a fun new way to enjoy it! Jicama is one of my favorite veggies to eat raw, and its sweetness is really nice with the sharper Vietnamese relish. Hope you like it! This I’m making exactly as it is. Oooooh momma!! Looks easy and fun. Tried ur mayo and tuna salad recipes….THANK YOU!! Now wanting a reason to make the mayo again. Have all the ingredients at home and think I’ll try it tonight. Woot! Where do you find your Red Boat fish sauce? Do they sell it locally at HEB? Welcome — glad you found me! And thanks for the recommendation. I *think* we’re getting a Trader Joe’s here in Austin soon… finally! Another fresh, delicious, genius recipe from the House of Mel. I was a bit intimidated by the lengthy ingredient list at first (and second) glance, but my food processor lent a powerful hand, and the effort was TOTES worth it. You’re right; the sweet jicama is the perfect foil to the spicy relish. And OMGGG I brined and poached my chicken (bone-in breasts), and it was so deliciously moist and juicy I actually laughed out loud while shredding it. You are a kitchen wizard. Thanks so much for sharing another fresh, seasonal recipe! Rock on. I’m so glad you liked it! Yes, it’s a langthy ingredient list, but all salads worth eating are like that, no? At least it’s all chopping and EZ cooking. Pingback: Vietnamese Chicken Salad - Paleo Chicken Recipes - Sharing New Recipes Daily! YAY! I’m happy you liked it! I really like this one, too… maybe I’ll make some in my next cookup. Good to know it ages well, too. Happy cooking to you. Love this! I got such a huge jicama that i chopped a lot of it up and added it to the veggies in the salad. The flavors are great. I’m going to try the Thai Yummy salad next. I have both Well-Fed and Well-Fed 2 and they’re getting kind of tattered. Citrus Carnitas are simmering right now on the stove, making the house smell delicious! Weekly cookup today, can you tell? Hooray for your Weekly Cookup! And thanks for buying our cookbooks! So happy you’re having fun with the recipes.